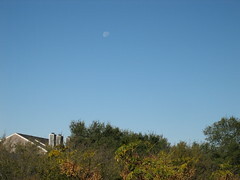 That's the view from our apartment balcony (click for a few more), I like how you can still see the moon. Autumn here is blue and yellow- bright blue skies and yellow leaves. It looks nice but is very chilly, at least in my opinion (about 40 degrees when I woke up). Yesterday Austin and I started browsing for a sectional sofa since we got rid of two couches when we moved. 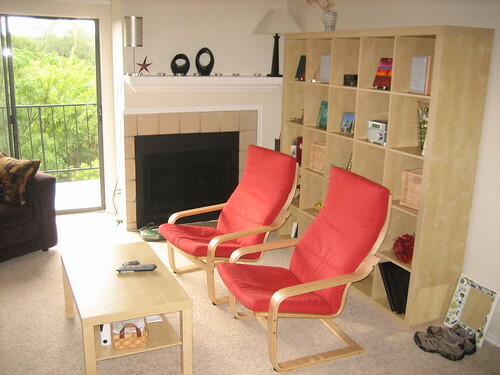 Our new living room will be really sad if we just have two Poang chairs from Ikea and not much else. Fortunately, we both have the same ideas in terms of style and colors and of course, comfort. It was so fun to look and we are both Crate and Barrel junkies and just want to move into the store itself. Last night, Austin and I made corn chowder for dinner, he watched a movie, and I worked (syllabus revisions, conference proposal, and article searches). We made sure the heat was on when we went to bed, I threw a sheet over the container garden on the balcony, and we put extra blankets on our bed. Our thermostat said 68 but Austin, ever the scientist, triangulated the data (!) with other thermometers and we concluded that it was really about 65. Brrr! But it did feel nice to curl up under lots of quilts. Today is the usual Saturday stuff with a Target run, groceries, work for me (lots of reading and maybe some grading) and the Packer game. We don't get all of them down here so it'll be fun to watch today and we can think of my cousin Erin and her fiance (and Austin's former roommate) Paul at the game experiencing Wisconsin-style cold weather!